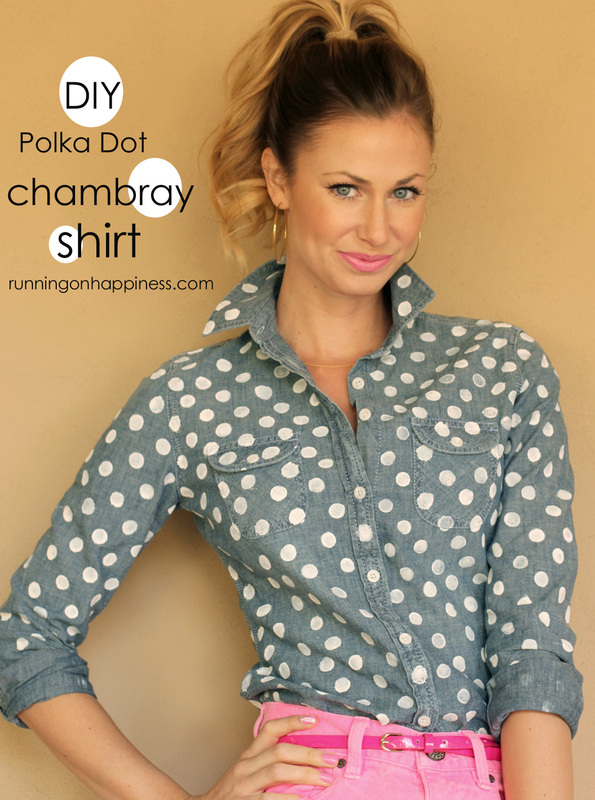 Two of my favorite style trends for spring, other than pink, are chambray tops and polka dots. 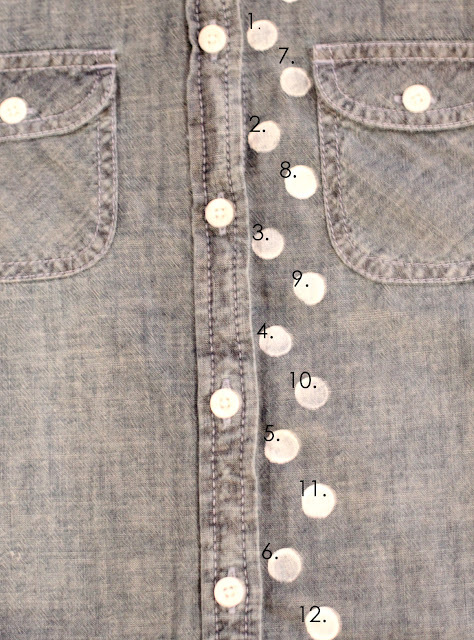 I have seen a couple chambray polka dotted tops floating around on these here internets. However, most of them carry a heavy price tag around $60-120. Since I had this old American Eagle chambray top lying around, I thought I would take matters into my own hands and give it a little face lift. This project cost me around $7 total, and is super easy to do! Just plop yourself in front of the TV for an evening, and get to polka-dotting already! 3. Plaid Daubers for stencil effects, in sizes 1/4 inch and 5/8 inch, also purchased at a local Michaels. 4. Piece of cardboard or an old magazine to place between the shirt, to prevent any bleeding. 1. Lay a buttoned shirt on flat surface, with a piece of cardboard or an old magazine in between to prevent bleeding. 2. Lightly dip your dauber into the paint, making sure to remove any excess. 3. 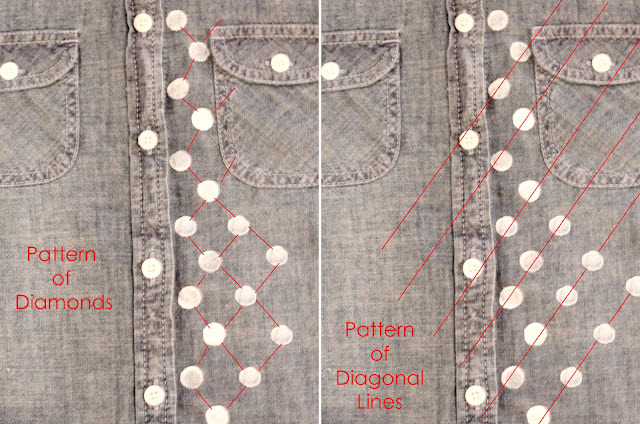 Start on the front right side of the shirt, placing polka dots in a straight line down the seam next to the buttons. You can gauge how far apart you want your polka dots to be. 4. Once that row is complete, begin placing polka dots to the right, in the middle of the first two polka dots you made, as such. 5. You are basically creating a series of diamond shapes, or diagonal rows of lines. Make sure to line up the dots. But don't worry, it doesn't have to be perfect. 6. 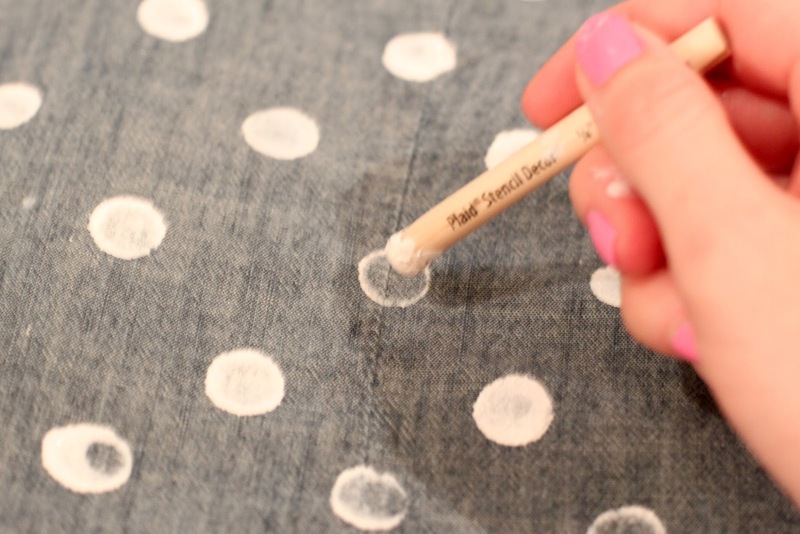 If you find your dots uneven, take the smaller dauber, dip it in a little paint, and fill in the larger dot. You'll be doing this a lot. 7. 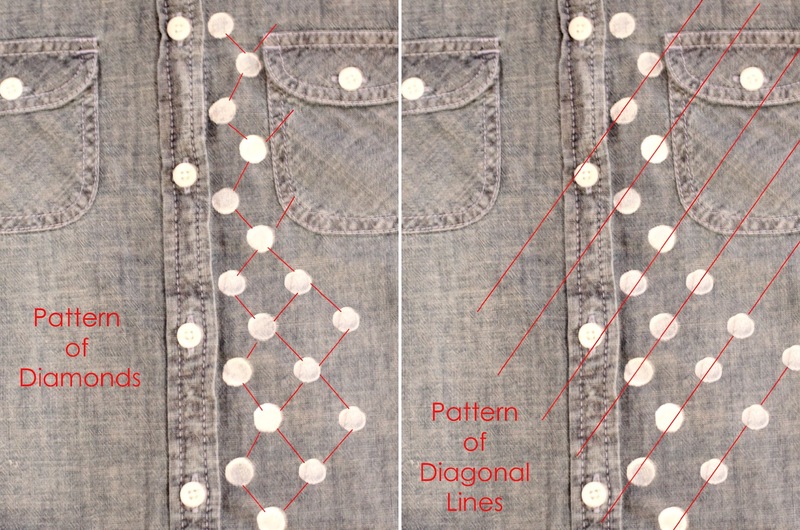 Once the right side is completed, polka dot the left side in the same manner. 8. When it comes to the sleeves, lay the sleeve flat. Start your first polka dot line closest to the outside seam, and work your way up and out. 9. Once the front of the shirt is dotted and dried, flip it over and repeat steps on the back. 10. Let dry over night, and then wear! Polka dotting this chambray top took me a total of 4 hours. But it was all in the name of fashion and fun! I'm surprised how much I am really loving the results. Today I tucked it into a black pencil skirt for work. 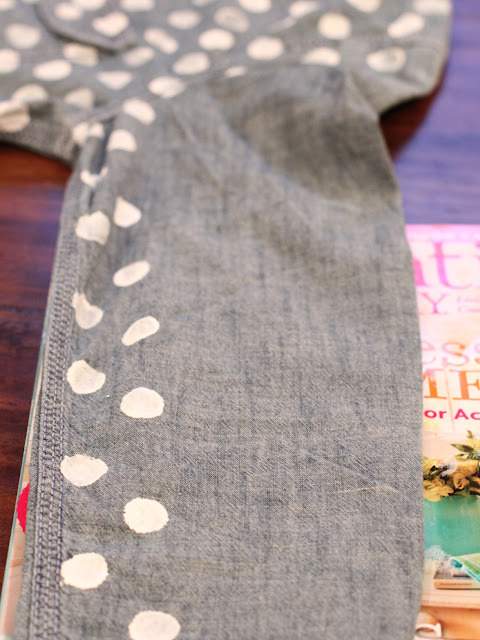 I hope you found this DIY helpful, and maybe, even a little inspired to do some polka dotting on your own! Ooh love this. My only question is if it will last after a wash though. Have you had to wash your shirt yet, I'm scared it will peel off or fade. What a great idea! It looks so cute! Love it! this is sooo cute!!! i love it!! but i don't think i'd have the patience to do it.. haha! Love this! A DIY must! This is really cute, I hope it lasts through it's first washing! Can you let us know how that goes? You're right, the polka dot trend is so pricey right now! How fun! This could totally be done on jeans too...I love the AG polka Stevie polka dot denim but don't love the price tag...hmmm, something to think about. Great idea...thanks for sharing! What a great DIY idea, I'd definitely have to make the time to do this cause it looks incredibly fun! such an amazing idea! i love how it turned out! Wow!!! Amazing!! I want to try this!!! What a genius idea and it turned out adorable! I really like your DIY polka dots chambray. How did you make that button shape consistent? do you have a pattern for that? What a fun idea! So cute. SO cute! I love your hair and makeup in these pics, too! This is ADORABLE! So creative! Love the mix of both trends! aww so cheerful, I love it! SUCH a great idea. It's so fun and custom. Thanks for sharing. love this idea! and i love love love your blog! Great idea! The shirt looks so cool! such a smart idea! I only have one chambray shirt, but if I pick up another I'll definitely try it out! What an awesome idea!? I am loving polka dots and am thinking of trying the chambray trend. Have you washed the shirt yet? If so, did the spots bleed? Such a cute project! Love it! WOW! This looks soo legit! You are such an inspiration! What a fun project! I love the look. Is the fabric paint durable enough to withstand the washer? ADORABLE! I just bought the quiksilver one, but yours is cuter! Super crafty, Katie. I'm gonna try this with neon paint! Okay, you are my new favorite person, I love polka dots! Really cool idea. i like it. I think people should go through it. Thank you for sharing.